I first want to say I am happy the baby is safe and sound. I never wish harm on any child, or adult for that matter. Unless of course, the adult has done harm to others! Why was the child left alone in the car in the first place? Almost every gas station has “pay at the pump” so PAY AT THE PUMP! If you do not want to be bothered by getting your child out of the car and then back in, DO NOT LEAVE THE AREA! It’s as simple as that. Yes, it is sad that the day of walking away for a few minutes and everything being ok is gone. People have to start taking responsibility for their own actions! Don’t leave your child in a car and then wonder why something happened to your child. It’s not rocket science people! The other part of my question….IF you MUST leave your child in the car while you ran in to pay, WHY did you leave the vehicle in a position to be taken? Did you lock your doors? Did you take your keys? Did you leave the windows down all the way? It would seem to me that; IF you rolled the windows down (ventilation), but locked the doors, and took the key, there would not have been time for a car jacking. They would have tried the door, locked…dang it, move on to the next vehicle. If they had enough time to pop the lock AND Hotwire the car, HOW LONG was the parent inside “paying” for gas??? This is summer!!! You shouldn’t have been away from your child that long! I don’t think anyone of legal driving age has the excuse “I didn’t know what could happen” when they leave a child or an animal in a hot car. Ignorance is NOT bliss! My dogs love to travel in the car with me. The minute it starts hitting 70+ degrees out, I think before they go with me. Will I have to stop and get out and leave them? What is the high temp for the day? I know dogs are not children but I’m going somewhere with this. I THINK about the steps BEFORE I leave the house. I travel with my dogs, sometimes even in the summer. That takes even more preparation. Here are my steps when I stop to get gas and / or use the restroom when I’m traveling with them. 1. Leave the windows down while I’m pumping gas. Talk to them. Make sure their heads can get out the window but not their bodies. Not always an easy task when one is 100+ pounds and the other is 18 pounds but I’m checking it and gauging the windows at that time. All windows EXCEPT the driver’s side window is down pretty far. 2. They have a water source. It used to be a big bowl, but the mastiff would tip it over. Now they have a double-sided cooler I had in my basement that I never used. It’s high enough to hold water and heavy enough to keep from tipping. 3. I lock the doors and take the key. 4. I set my timer on my phone for 5 minutes. If my timer goes off and I am not walking out the door yet, I put stuff down (if buying snacks, etc), go out, check on them, go back in and finish the transaction. I make sure to set my timer again as I go back in. Parenting, be it to two-legged babies or four-legged babies, isn’t easy. We make decisions for them all the time that we then look back on and say…. WHY did we do that? We can’t plan for everything ahead of time, but just stopping and thinking about all possible scenarios for a few seconds and then acting on it would probably stop a lot of the stupidity! Have you ever had one of those weeks that you felt like you were falling apart? I was having one of those weeks. It all started with the poison ivy. Now, I KNEW there was poison ivy around my tree in my back yard. I have been fighting with it for a few years now. It has never really been a problem for me, so I didn’t think a lot about it. I knew I was going to be closer to it because I was trying to kill it more, including killing the vines. I did what I was supposed to do, wore gloves, tried to be aware of what I was touching, but let’s face it, sometimes you just want to get the job done. I had my clippers out there, my weed eater, gloves, etc. Needless to say, a couple of days later, the skin around my eye is swollen (I vaguely remember wiping the sweat away with the back of my gloved hand), my knee is covered in bumps, and I am spotted all around with lovely little bumps. The first couple of days, they were irritated, but not too bad, I picked up some cortisone, and thought, Hey, I can get through this. Then the itching started! Oh the horror!!!! NOTHING could make it stop once it started itching. I scratched. Then I bled. Then I was mad at myself. Over a week later and I still have not healed completely. It has been horrible. What did I learn? Longer gloves, wear a hat to minimize the sweat running down my face, and wear pants, not shorts! Hopefully I will never have to endure it again. So, all by itself, that sounds like a bad week. Oh no, I can’t stop there. My back starts hurting. First it was just a little irritated, took some Excedrin Back and Body (side note, if ANYONE reading this knows where I can still buy some of this, please tell me. Wal-Mart and Target do not carry it) So I take the Excedrin and it feels a little better, but still hurts. I don’t let it stop me. The next morning, I’m taking two more because it’s just not getting better. Went for a 2 mile walk later that day and I could feel every step going up my back. Decided it was time for something stronger so I picked up some Doan’s Back pain pills. Those always seem to work. Took 2, felt a little better, went on with my day. By the weekend, I was taking Tylenol 3 with Codeine and finally relaxing it a little. I still had to get the housework done, the horses fed, still had to lift my mom’s scooter in and out of the van, so I didn’t take the time to truly relax it, just lived with it the best I could until I could get in to my chiropractor. All in all, a pretty painful week….but Still wasn’t the worst. I was downstairs in my basement and had to unplug my dehumidifier for a short time. Not a big deal, unplug it, get the other stuff done, and plug it back in again. Of course, I didn’t plug it back in right away, I got sidetracked with other things. I was downstairs moving something and took a step back. Pain went SHOOTING through my foot. WHAT THE H*LL????? That hurt!!! I have never been one to swear when I hurt myself, but that one cause more than one word to come out of my mouth. I have never had that much pain from stepping on something. I look down and see the plug to my dehumidifier. It hurt like you could not imagine. I’m walking funny, trying to will the pain away. Of course, walking funny causes more pressure on my back. It was a nightmare circle of pain. I finally manage to limp upstairs and decide to lay down on the couch. I was not moving for a while! A few hours later, I went to stand up and pain shot through my foot again. WTH???? 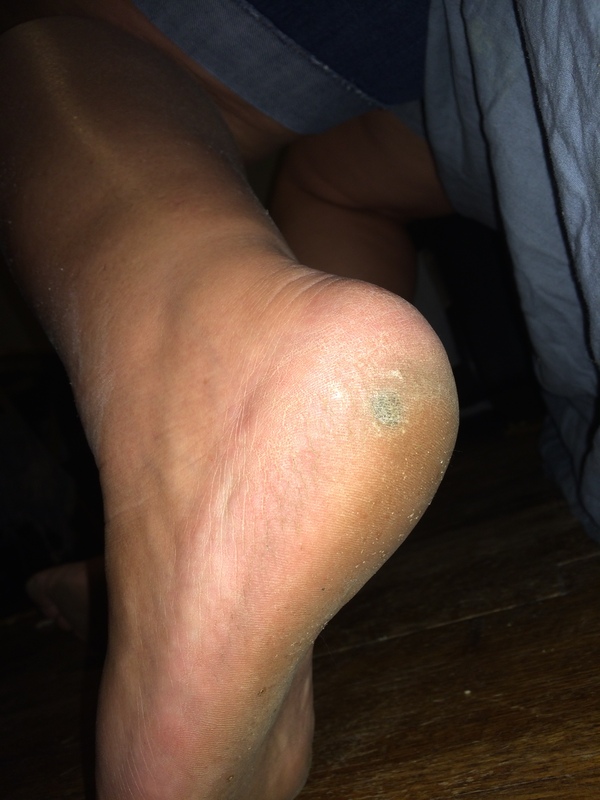 I’ve never had my foot hurt a few hours after stepping on something. I push down on my foot and I feel like I’m standing on a marble or something. Yes, I stepped so hard that it bruised but also became so inflamed that it was a little round bump right on my foot. Of course, it was on left side of my left foot so the only way to see it was to twist my leg / back…..sending MORE pain through my back. I decided….I’ll just take a picture of it! Nasty isn’t it? The blue circle may look small, but trust me, the pain was mighty! It lasted for over 4 days, where it hurt to even walk on it. For those that know me, they know that I love to walk around barefoot pretty much all summer. It is not common for me to have shoes on at all and when I do have shoes on, it is usually sandals or flip flops, so having something that painful made it difficult to walk, difficult to stand. I never want to go through that much pain on my foot again! Here it is; almost the end of the week and my back is just now getting back to normal, thanks to a couple visits to the chiropractor. My foot pain is virtually gone, unless I step just right on it (which I try not to do) and my poison ivy is still hanging on. All in all, I will be happy to have some pain free time anytime! I welcome it!